I just love grandkids. People joke around saying, "If I had known how fun grandkids would be, I would have had them first!" Today we went to my parents' house to celebrate my older brother's 65th birthday (he's joining the Catholic Church this Easter too!). All my grandkids were there so we went out and had adventures. Baby Gianna was too small to go along. 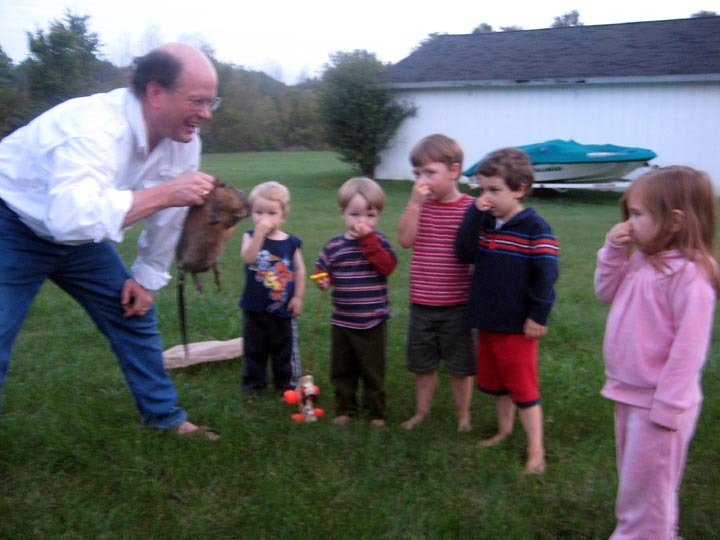 I found a smelly old muskrat which is why the kids are all holding their noses. I'm a crazy grandpa and I like to be a bit unpredictable and adventurous and fun. For those who are from the 70's, you may remember the goofy song by the Captain and Tennille entitled "Muskrat Love." Finding this furry little creature made me remember that old song from my younger years so I had to try and remember it. Please don't click this link unless you want to hear two guys playing guitars and singing this dumb song about muskrat love. Hi Steve. You mentioned that your older brother is joining the Roman Catholic church. Have your parents converted also? I just would like to know. Thanks. Steve here: No, my younger brother and his family and my older brother have converted. My parents are almost 90 and have not converted but they are no longer hostile. They are very proud of us and very friendly to Catholic things. They even visit Catholic churches with us once in a while. I just saw this. Great news on your brother’s conversion! You make me quite jealous that your such a young grandfather, I am in my early 30s and I have still not settled down as yet, I have got quite a lot of catching up to do when I compare myself to you! You should move to Europe, they need more people over there with its declining birth rate! God bless you Steve and all the great work you do. Previous post: This Might be a Good Movie?